Today, the Supreme Court took up the question: If some of ObamaCare is unconstitutional, can any of the remainder be allowed to stand? Or to put it in legal parlance, is the individual mandate to purchase health insurance "severable" from the rest of the 2,801-page Act? In this enormous law, all of the myriad parts are interwoven and therefore the law should be struck down in its entirety. 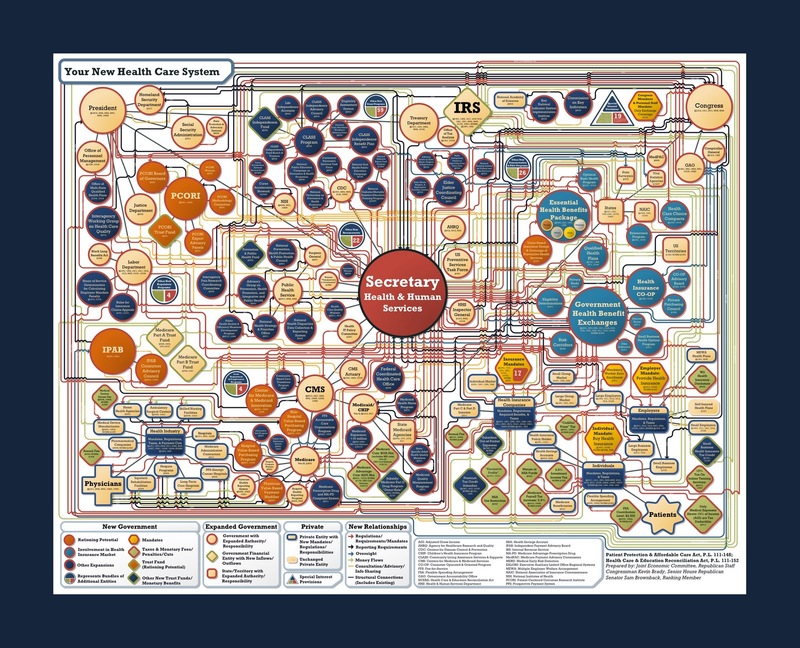 By the way, the chart, titled "Your New Health Care System," was first released in July of 2010 by Joint Economic Committee Republicans to help the American people, in the words of then-Speaker Nancy Pelosi, "find out is in" the controversial law. Also, I can't help including this humorous video "tour" of the Chart. TAKE ACTION: Join nearly 200,000 of your fellow citizens and sign the petition to End ObamaCare Now!